This lively contribution to a major reassessment of nineteenth-century Wales challenges the widely-held Welsh historiography in which the contribution of the landed classes is marginalized in favour of the success of radical liberalism and nonconformity. This account of nineteenth-century Carmarthenshire emphasizes the social and political dominance of the Anglican and landowning nobility and gentry for much of the period. 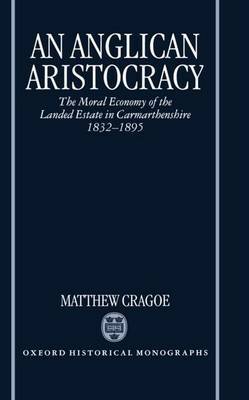 Matthew Cragoe explores the nature and public roles of a governing elite, arguing that their influence was not simply a function of their members' wealth or their control of local government and the administration of the law, but had a vital ideological dimension in the aristocracy's paternalistic ethic, which found powerful and practical expression in the 'moral economy' of the landed estate. His clear and vigorous narrative is unerpinned by detailed analytical chapters on agriculture and rural society, the administration of law and local government, the evolving patterns of electoral politics, and the vicissitudes and advances of the Church. Frequent references to other Welsh counties and to England show how this local study has much wider interest and implications than its immediate setting. Matthew Cragoe argues for a re-evaluation of the social, political, and cultural contributions of the Anglican aristocracy to the making of a Welsh identity in the nineteenth century.